Comments: First couple seconds sounded tempting but rest of Off Kilter was pretty bland. Comments: This band is crazy and fun! I saw them for the first time when I was 13 walking around Epcot, Disney World! They were great! I absolutly loved them, I would recomend them to anyone! Comments: Off Kilter is what started me in my celtic music addiction! I first heard this band as I was walking the grounds of my first Irish Fest in Milwaukee, WI. The sound of this group just drew me in like a magnet. Off Kilter takes many well known popular celtic tunes and twists them a bit with a rock feel. It's hard not to dance when seeing them perform live. A great act to see if they're ever in the area. Etched in Stone is Off Kilter's second album. Other albums include "Off Kilter", "Celtic Armadillo", "The Live Tracks", and "Kick It". Write about Etched In Stone! 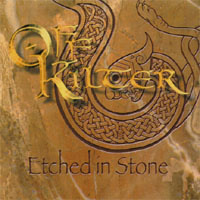 Want to write a review about Off Kilter's Etched In Stone album? Post your comments in this box to be displayed in our community forums and in our album database! Please make sure you are logged in before proceeding. Please login to write your comments about Etched In Stone.